Projectors are ideal tools for sharing presentations, displaying pictures and watching movies, and are a great choice for broadcasting on a large screen. However, while they're certainly more portable than most TVs, projectors can still be quite large and unwieldy. This can make it difficult to find a place to position them, and placement is an essential consideration when using a projector. It also means they're not very portable. 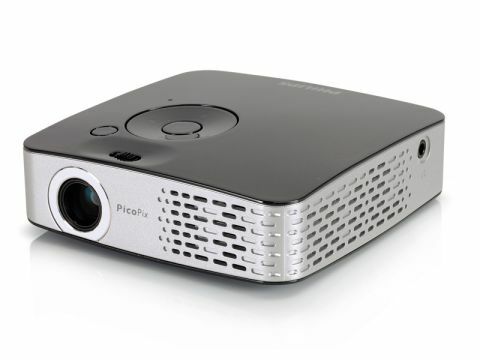 The Philips PicoPix PPX 1430 is a high quality mini projector that's incredibly well built and doesn't suffer from the corner-cutting and compromises that tend to plague hand-held devices of this sort. The projector comes with composite leads for connecting to DVD players. If you want to connect the projector to your PC then you'll need to buy a separate VGA connector cable, which is a bit of a pain, as that's what you're most likely to be using it for. You can attach a USB flash drive to the projector and play compatible files from it directly, or use an SD card from a camera and camcorder. This goes some way towards making up for the lack of VGA cables. You use the buttons on the top of the projector to find compatible movie and photo files – access the menu and you'll find them in the 'Videos' and 'Photos' folders. File compatibility can be a bit hit and miss, with WMV files not recognised, but MOV files playing fine. You may need to convert your videos if you want to play them from a USB stick or memory card. Photos are displayed automatically in a slideshow with randomly generated transitions. On the whole, the image quality of this projector is very good, especially considering its small size. It can broadcast images up to 80-inches in size, though around 40 to 50-inches is best for the Philips PicoPix PPX 1430. Basically, it's a decent pocket-sized projector.